The New Zealand police met with the accused Christchurch attacker in October 2017 before granting him a gun licence, authorities said on Friday, news agency AFP reported. Australian Brenton Tarrant, a self-avowed white supremacist, armed with semi-automatic rifles including an AR-15, last Friday killed 50 people in two mosque attacks in Christchurch. He had applied for the gun licence in September 2017. As per a police spokesperson, a “firearms vetting team” personally visit anyone who applies for a gun license to ” inspect the security of their property.” The police team carried out the visit in October, interviewing Tarrant and carrying out a “security inspection” of his home, he said. During the security check, Tarrant also provided the names of two New Zealand residents as references, who were also interviewed by police. The referees “met the requirements of the process,” he said, without identifying the two persons. The license was approved in November 2017, he added,. Authorities say Tarrant legally purchased a number of weapons in December 2017, including the two semi-automatic rifles, two shotguns and a lever-action firearm he used during the attacks on the mosques while people were attending Friday prayers, the news agency added. In the 74-page manifesto he left behind, Tarrant talks about an “invasion” from India, along with China and Turkey, and defines the three countries as “potential nation enemies in the East”. Six days after the attack, Prime Minister Jacinda Ardern announced a ban on the military-style semi-automatic and assault rifles in the country. The new laws should be in place by April 11, she added. “On 15 March our history changed forever. Now, our laws will too. We are announcing action today on behalf of all New Zealanders to strengthen our gun laws and make our country a safer place,” Ardern said. 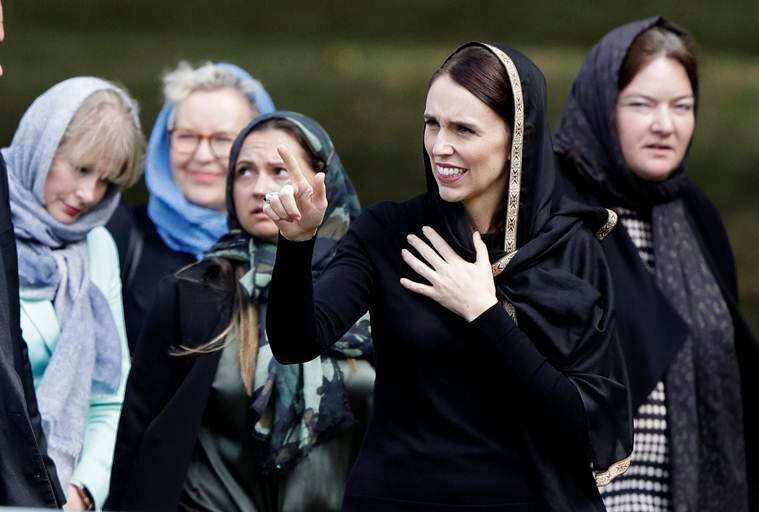 As a mark of homage to the victims, women in New Zealand today wore makeshift hijabs and the men donned the scarves on their shoulder. They also observed the Muslim call to prayer, followed by two minutes of silence. “New Zealand mourns with you. We are one,” Ardern said in a short speech.